The Supernatural fandom is nothing if not passionate. Vocally passionate. About everything from plot details to Sam's hair to the subject of this particular post: recurring characters. For the most part, we're a fandom of love. But sometimes there are characters that, for whatever reason, get people fired up, and not necessarily in a good way. A character you hate and a character you love to hate are two very different things. The characters in this list are ones that seemed to have inspired the most passionate love/hate from fans. You will notice that a certain gender seems to dominate this list. What does that say about the fans? Hmm. Hmmmmm. A lot of people love Castiel, but lest you forget, a lot of people also hate the whole angel storyline, and therefore are not so big fans of Cas. Those that are not so big fans of Cas, I think, don't like that he detracts from the true love story of the series - the bro love of Sam and Dean. But hey, you know Sam will always come before Castiel for Dean, you guys. 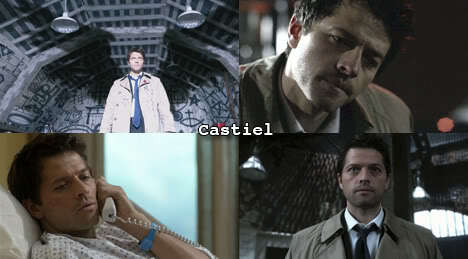 Especially now that Cas isn't entirely Cas anymore. What's to become of him this next season? Who knows. Personally, I was always a fan of Lisa and Ben. They represented the life that Dean always secretly wanted, and let him have it for a while. That relationship did make for some awkward fits and starts in the sixth season, though, so I can understand how people were more or less relieved to see their story wrap up. But you can't deny that the way it all ended was heartbreaking. Jo is an interesting one. When she first came on the show, it was so blatant that they were trying to make her a love interest for Dean, and there was just so little chemistry that it just all felt sort of... hinky. Eventually this was remedied to be more of a one-way interest, except for that part where Dean kissed her before she died, you know. Then it didn't seem as weird. What? Huh? A few years makes a difference, apparently! Like I said, an interesting transformation. Beginning: no one much likes her. End: everyone loves her and is sad to see her go. Go figure. Oh, Ghostfacers. Myself, I love the Ghostfacers. I thought that whole episode was genius and I find them really hilarious. Others, for some reason, seem to hate them. I don't know if it's because in their episode Sam and Dean weren't the main focus, and that makes some fans nutso, or what. But come on! The theme song alone! 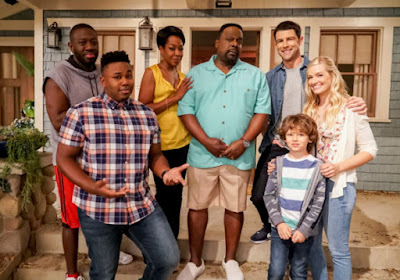 It remains to be seen whether they will make a reappearance, though they did get their own mini web show you can find online somewhere. Here's the thing about Bela. Her introduction was awesome, but somehow after that her antagonistic flirtations seemed to rub everyone the wrong way. Maybe it was because she wasn't a very sympathetic character, or maybe fans just hate women, even though they're like 80% women themselves. Self-haters? In any event, Bela's backstory, that may have warmed people up to her, came way late in the game, perhaps too late to redeem her in fans' eyes. Plus she was in that horrible ship episode, and we all like to forget that one, even Kripke. You knew this one was coming. 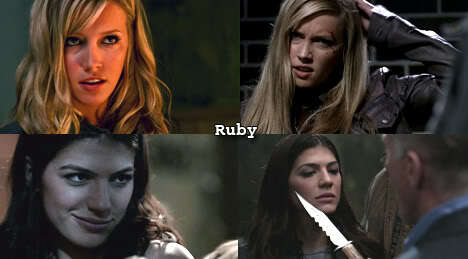 Ruby is perhaps the most controversial character ever to grace the Supernatural series. But what's really interesting is this: most people did not like Ruby from the start, in season three, when Katie Cassidy was playing her. Then the strangest thing happened. Come season four, Genevieve Cortese (now Padalecki!) took over the job, and suddenly everyone was saying they loved old Ruby and hated new Ruby. Innnnteresting. And to be perfectly honest, I kind of find myself in that camp. It's nothing against Genevieve, I guess what we didn't like was that she didn't seem like the same character, and as I've heard Genevieve say, that was what they wanted her to do. So... it's not her fault, people. Nonetheless, everyone cheered when Ruby was killed. You know you did too. ﻿Time to vote for who you think is/are the most controversial character(s)! Don't worry, I've got some more ridiculous lists coming up. Like the best Dean eating scenes. You know there are a lot of those! For my past top ten lists: click here. How can anyone not love The Ghostfacers! They were such fun. Hope to see them again. 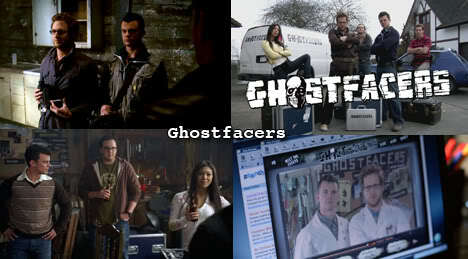 I love the Ghostfacers too, but I have heard from a number of different people that they dislike them. I don't get it! They're hilarious! I loved Bela and Jo, I especially loved the Ghostfacers. What about Meg? She was pretty controversial too?